Mandarin & Apple flavoured Green Tea with Guarana and added Vitamin B6. Vitamin B6 contributes to normal energy-yielding metabolism. Enjoy at least 1 cup a day as part of a varied, balanced diet and a healthy lifestyle. Feeling full of energy is the inspiration behind this carefully crafted Energise blend. 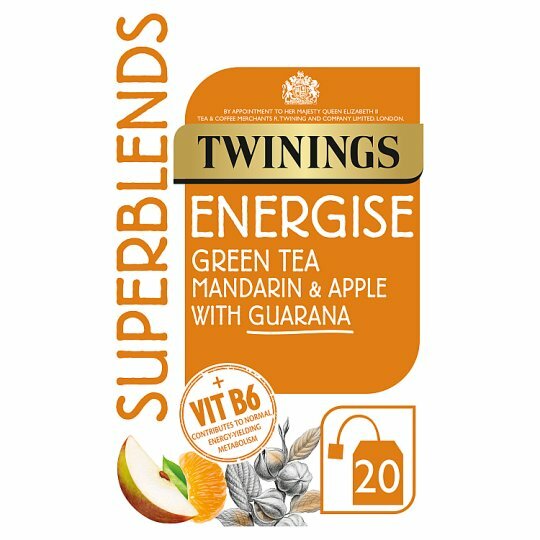 This blend contains Green tea and Guarana, with Mandarin and Apple flavours which bring delicious sweetness. We've also added Vitamin B6 which contributes to normal energy-yielding metabolism to help you feel at your best every day. This delicious green tea has subtle citrusy flavours from the mandarin. It's clean and fresh tasting. Guarana is a green plant, predominantly grown in South America that contains high levels of caffeine. We have used sweet Mandarin flavouring to bring a delicious orangey flavour into this blend. Our crisp green teas start their journey from the dewy, misty tea gardens of China. The teas are gently pan fired. By Appointment To Her Majesty Queen Elizabeth II Tea & Coffee Merchants R. Twining and Company Limited, London.